Today I made a cake. You may not think that is unusual for me given past posts on this ‘ole blog of mine, but in recent months I have not ventured into the baking zone very often. Today though, I had the urge to create something pretty. And tasty. There was also the realisation that my mother’s 70th birthday is looming and I needed to test a couple of recipes before I inflict them on her party guests! Also, Mr INTJ’s daughter turns 16 on my mother’s birthday and I have been informed cake will be required for that occasion too. So it’s time to get back in the kitchen. Today’s efforts have produced this little beauty. Isn’t it gorgeous? It’s a double layer vanilla cake, sandwiched with Lemon & Passionfruit Patisserie Filling from Barkers and generously coated in Swiss Meringue Buttercream. And then I added some sprinkles. Because sprinkles make me happy. And I may, or may not, have sprinkled a little pink sugar on it as well. It’s almost too pretty to cut! Now, down to the nitty-gritty. 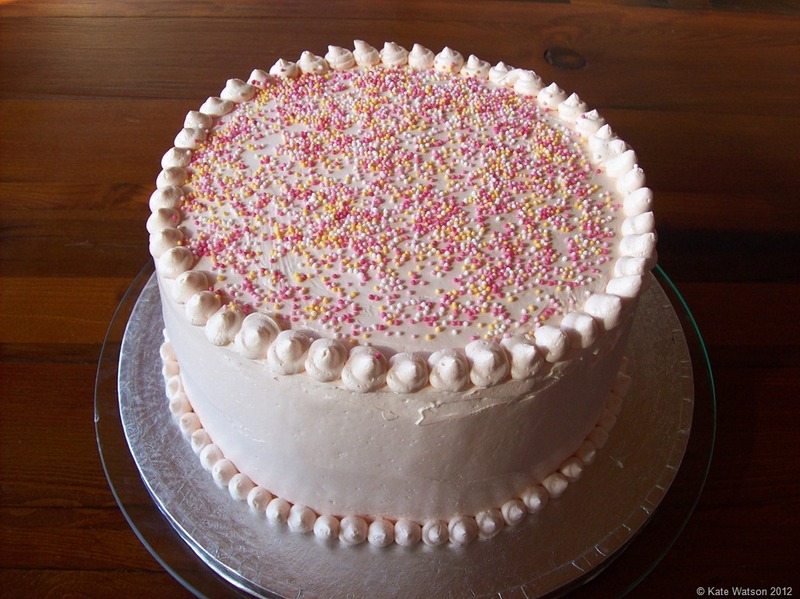 Although I have a lot of recipes, I still needed to find a good all-rounder birthday cake that wasn’t chocolate so I decided to try this one from Smitten Kitchen. Now, if you look at recipes from USA they often list ‘cake flour’ as one of the ingredients. I’ve looked in every supermarket I have been to for cake flour and never found it. But not to worry. Joy the Baker comes to the rescue and explains how to make it yourself here. 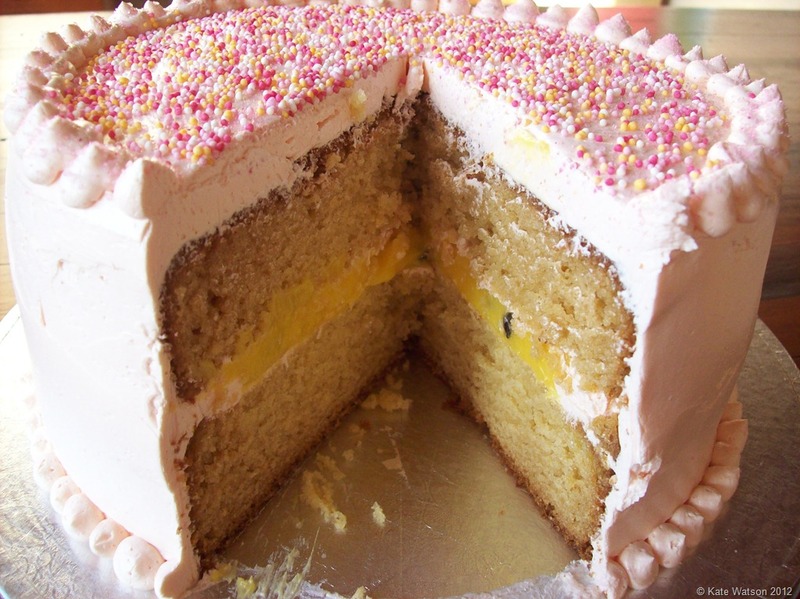 The Lemon and Passionfruit filling was easy – it’s a store bought one from Barkers that I have been eyeing up for months. When I went to get some yesterday it was on special (yay!) but unfortunately it appears Barkers may be deleting it from their range as the links on their website no longer work. I hope I am wrong as it is delicious and so much easier than making passionfruit curd from scratch. 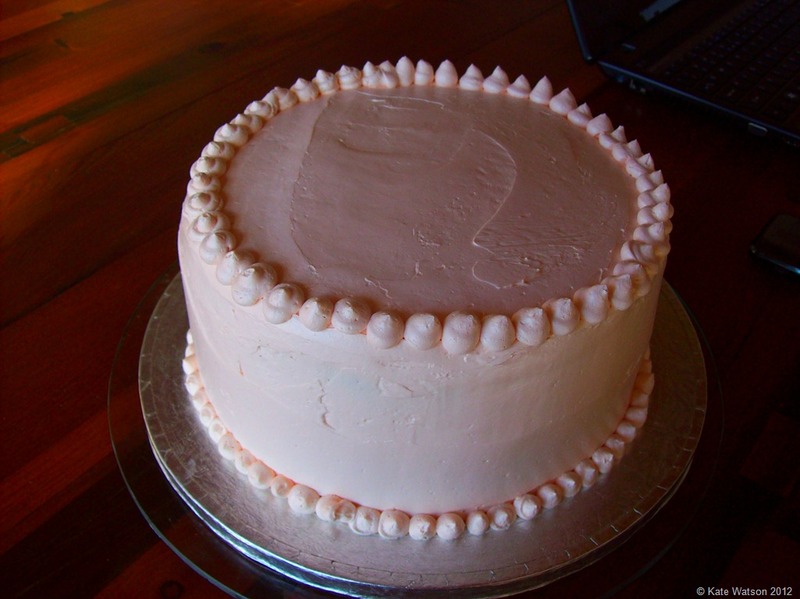 And the Swiss Meringue Buttercream… ahhhh. It’s soft, and light, and fluffy, and not overly sweet like regular buttercream. I had been avoiding trying to make it for years thinking it was doomed to fail – I had read about people giving up because it just turned into a curdled mess. But apparently the secret it to whip it. Whip it good! And it comes back together beautifully. Mine seemed to just work without the curdled stage. Thank goodness for my Kenwood mixer! Anyway, the recipe is here – again from Smitten Kitchen. Now that the taste testing has been completed, I can confirm today’s efforts have been a success and I will be making this again. And again.